Many thanks to Tom Gardner from Family Mosaic for organising this amazing day for the whole of The Wick! There was so much to do - footie, smoothie making, henna tattooing, herb planting, photographic masterclasses, easter egg (word) hunts, safer neighbourhood team chats, cycle repair workshop, etc. This is exactly what a community event should be all about. Local people meeting each other in a relaxed, informal & informative way. Tom - we all enjoyed ourselves immensely - thank you. Remember that tipper truck that drove into Leabank Square and off loaded loads of rubbish in February? Well - while we were clearing it - we found a few sorry looking sawn up branches in builders buckets. I stuck them into water to see what would happen - and Voila!!!! The spring weather, a few weeks in the greenhouse, a good drink, some food - and we now have four new trees budding! One is definitely a Birch tree with it's distinctive bark. One is an Ash tree - the other 2 are still a bit battered to tell - but could be Hazels. Anyhow - the Gardening Club are looking after them with much love and affection - so watch this space - and we'll keep everyone updated with any news in the next few weeks & months. Of course we need to thanks the ignorant fly tippers for dumping them (literally) on our doorstep - but I don't want to be encouraging them to do more messing in Leabank Square!! Want to plant some seedlings for your neighbour? Maybe get your plumbing fixed in return? Good guitarist? Give lessons to someone else. Can't reach your top windows - borrow an extra long ladder? Please come along to the Hackney Time Bank Launch at the Wick Community Centre this Saturday 27th March between 11am & 4.30pm. There will be smoothie making, henna tattoos, food, fun football - plus bring along any broken bicycles and get them fixed for free by the Bike Dr!! Come on Leabank Square - let's get sharing & making The Wick a lot nicer to live in! Adul Majid, Aamna, Aalya & Safiri got our veggies off to a brilliant start today with the first Gardening Club seedling plantings. We cleared the greenhouses and made space for the new seed trays. Today they planted purple aubergines, Tumbling Toms tomatoes, large red chillies & Capsicum chillies - a few weeks in the greenhouse - and we should be able to plant them out at the end of May. Thank you very much team - we will all be tasting these delicious veggies this summer. A massive thanks to Helen Goodsell of Hackney Council for arranging this great meeting for Hackney Wick. We all got to meet many of the people who can make our lives a lot easier. From the parking department to the Olympic Park Legacy Company (OPLC). Once again - Rev Alan Piggot from St Mary's in the Eastway - set the meeting into context with a brilliant summary of the journey we have all been on the past few years. Then Charlie Forman from the Olympic Team in Hackney Council introduced us to the main speakers - Neil Walker from the London Organising Committee of the Olympic Games (LOCOG) - who are actually running the Olympic Games & Sarah - one of the Pathfinder volunteers - who help LOGOC run the games. We then heard from Emma Wheelhouse - from the Olympic Park Legacy Company (OPLC) - who is responsible for seeing that the Wick gets a good result after the Games. Of course - most of what they said was all spin. That is their job. They need to convince all their own line managers that they are doing their job - so they tick loads of boxes by coming out into the community. But the most important thing is that they have now introduced themselves to us. The rest is up to us. We need to make them aware of anything we want them to do. They are our servants. We are all paying their wages - and we are the ones living next to this huge park. We need to tell them what we want. To this end - I brought up the catering facility with Neil again - and he promised that some sort of answer was busy making it's way back to us about all the plans, timings, mitigation etc included in the original email. Watch this space. I the also asked Emma (again - again) - what was going to become of the footprint of the catering facility in legacy mode. All the plans still have a green open space directly opposite Leabank Square - but she still insists that the planning is in process - and that nothing has been decided yet. Again - I stressed upon her our absolute desire that we have it returned to Arena Fields (all be it - much reduced) - so that when the Gainsborough School Footbridge is re-built - it lands on a green open space. She is still spouting the same regurgitated answers we have heard many times before - but says that the planning is to be decided early next year (2011) and we should know more then. Remember to include Charlie Forman, Boris Johnson, Tessa Jowel & Meg Hillier in all your correspondence over this subject. We need them to impress on the OPLC that although we lost the lovely Arena Fields - but we can have some of it back in its original place!! All in all - we had an enjoyable day networking - although the Olympic part was the same old same old - just a few new faces. It was good to talk to Robert Kavuma about the noise before 8am on the Arena Fields Road. It was brilliant chatting to Felicity from British Waterways - always positive. Helen - once again - thank you so very much for getting this all arranged. You & the whole Hackney Council team made a big difference to the way we are all feel about this corner of your borough. Thousands of lovely delicious thanks go to Nawal & Mohamed for the beautiful cherry tree they donated to all of Leabank Square. At the last Leabank Square Gardening Club day - Nawal couldn't make it - but enclosed in her reply to the last gardening consultation - she made a very generous donation which turned into a scrumptious Stella Cherry Tree. 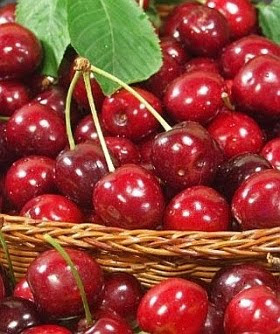 Stella's are very special & exceptional self-fertile, sweet cherry with large dark red or black fruit. White flowers appear in mid-spring, followed by delicious, juicy cherries which are ready for picking in late July. It is a vigorous grower, starting with an upright habit, spreading as it matures. An early and prolific cropper that also makes a good pollinator for other cherries. Nawal & Mohamed - thanks a million for your very generous donation - we will think of you both while we snack on your cherries. We've planted it in the greens middle planter on the north side - so keep an eye on it everyone. Oh - and feel free to water to it anytime. Cherries need loads of water - and this planter is well drained - so you cannot give it too much water. 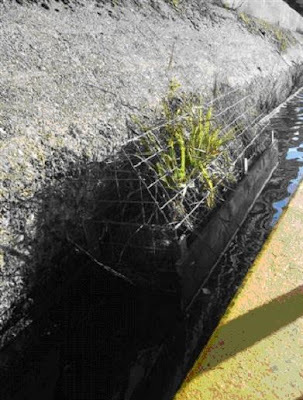 Thanks to our friends at British Waterways - we will soon have some amazing reedbeds all along our Recycled Garden. In a few short weeks - we will see some reeds growing up from the straw bales securely attached to the riverbank wall. Very shortly after that we should see many coots dragging all the flotsam & jetsam over to make their nests amongst the reeds. Soon after that we should have some of the frogs or toads (never know which is which) that serenade us late into the night - taking up any hiding positions between the bales waiting for passing dragon & damselflies to lunch on. The ecosystem of our riverbank should soon be teeming with the most diverse & interesting wildlife along he Lea - for us all to enjoy!! Thanks to Sarah for this brilliant donation of a Prunus domestica 'President' plum tree. 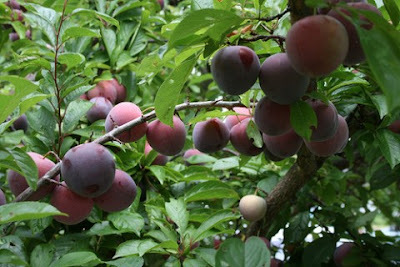 The President plum is a late ripening fruit that is a large, round to oblong fruit with blue-black skin. Flesh is fine-textured and yellow. It is a vigorous, upright tree that is a heavy producer. It is one of the last plums to ripen in the season. We have planted in the south middle green planter - so that in years to come we can pick a plum - and take a seat on the green enjoying it's deliciousness! Remember - you can't drown the plants in these planters - so if you ever have a few minutes to spare - please hook up the hose and give this tree (and any other part of the green) a good drink. Look at the amazing donation from Tom!! Today we painted them up in Leabank Purples - and next we could do with some help from car owning residents to collect the free compost from the Hackney Marsh Compost Centre. Then we hope to be able to buy some willows or olives to make a very impressive gateway up to the Recycled Garden. Tom - you are an absolute star!! Thank you for all the help you give us - collecting & delivering amazing things for our gardens! Without you - the gardens just would not be the same - thanks! !